“Madonna Japan”, the Women’s National Baseball Team, started their final training session and exhibition games in Matsuyama, Ehime Prefecture from August 5, aiming to win 3 consecutive titles at 5th Women’s Baseball World Cup in Edmonton from August 10. They have been stimulated by Gold Medal won by Japanese National Team at the 2012 ISF XIII Women’s World Championship in Whitehorse, Yukon, Canada for the first time in 42 years, as well as by the recent great success of Women’s Soccer Team, “Nadeshiko Japan”. 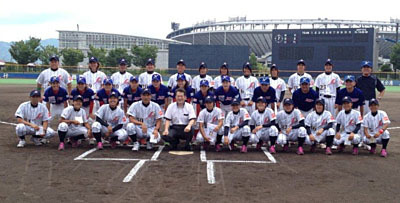 On August 5, Katsuhito NOSHI, Mayor of Matsuyama City, visited the ground to encourage Team Members. For the first time, 5 players joined Team Japan from the women’s professional baseball league including Mika Konishi (Osaka) and Yuki Kawabata (Kyoto). Ayako Rokkaku (Samurai), IBAF 2010 Female Athlete of the Year and MVP of 4th WWC in Venezuela, has been also selected among the 20 players. For full members’ list, visit website of Baseball Federation of Japan.